Further to recent blogs on breakfasts 1 and the ‘bliss point’ in processed foods 2 , I thought it would be interesting to take a more detailed look inside the body, just to see what actually happens when a highly processed sugary product, specifically Kellogg’s Frosties, meets the inside of a human body – touching on associated issues, ranging from insulin resistance and cellular respiration to diabesity and non-alcoholic fatty liver disease. It’s quite true that such breakfast cereals are great for the manufacturer’s profit and loss account, but what’s their true cost in terms of human health? 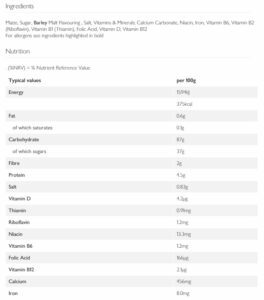 As you will see from the footnote below 3 , a 100 g of Frosties contains 87 g processed carbohydrates, 37 g of which is pure sugar (specifically, sucrose – a disaccharide consisting of one glucose and one fructose molecule). The carbohydrates are processed to remove nearly three quarters of the fibre contained in the original whole corn (also called maize) – 2 g/100 from 7-8 g/100 g in whole corn. This gives Frosties a glycaemic index (GI) of 51 compared to 100 for pure glucose 4 . To its credit, Frosties is at least fortified with several vitamins and doesn’t contain any palm oil. As soon as Frosties enter the mouth, the carbohydrate-digesting enzyme amylase produced in saliva starts to break down the sucrose into its two monosaccharides, glucose and fructose, and the lump of food in the mouth is then referred to as a ‘bolus’. From the mouth, the bolus passes to the stomach, during which time it magically changes its name to ‘chyme’ – a pulpy acidic fluid consisting of gastric juices and partly-digested food. 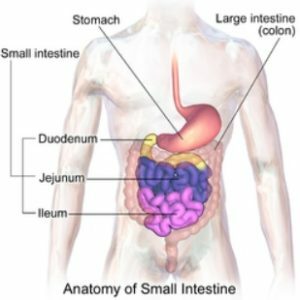 From the stomach, the chyme passes into the first part of the small intestine, the duodenum. A signal then passes to the pancreas for it to release pancreatic amylase along a duct and into the duodenum. At this point, a number of enzymes have pretty much completed the digestion of the sugars and any starches, producing the end product of the monosaccharide, glucose. 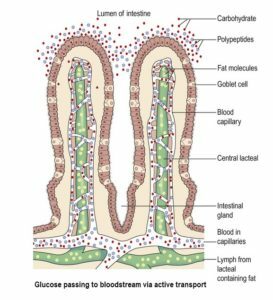 The resulting glucose within the mixed contents of the intestine (the ‘lumen’) then passes through the wonderfully complex epithelial membrane and into the bloodstream through an absorption process called ‘active transport’. Once the glucose levels rise in the bloodstream, the beta cells of the islets of Langerhans within the pancreas detect this increase and release the hormone, insulin – in healthy individuals, that is. The situation is different for those with type 1 diabetes (T1D), where the pancreas does not produce insulin (or only very small quantities). 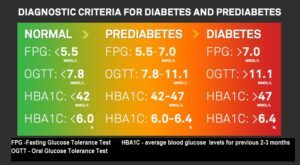 For those with type 2 diabetes (T2D), the situation is not the same, since plenty of insulin may be released from the pancreas but, for reasons covered below, fails to do its job properly. 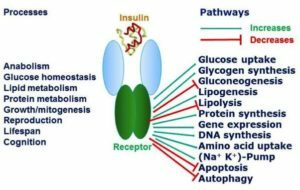 If blood glucose levels are too low, another hormone called glucagon is released into the bloodstream, this time from the alpha cells in the islets of Langerhans within the pancreas. 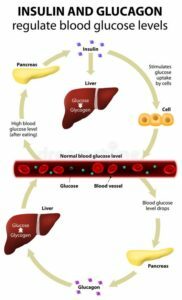 Glucagon’s function is to instruct the release of some glucose which has been stored as glycogen in the liver and muscle cells (a process called glycogenolysis). In our scenario, the sugar in the Frosties has been converted into glucose and has ended up in the bloodstream. 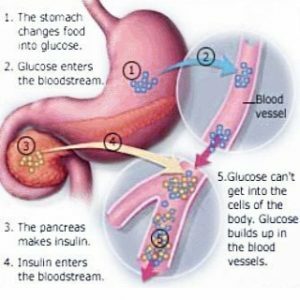 Insulin’s main job now is to get that glucose into the body’s cells. If it does so successfully – and this is the big IF when it comes to those with T2D – the glucose is oxidised in the cells (that is, the glucose combines chemically with oxygen) and becomes a source of energy. 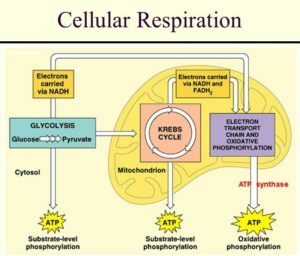 This intracellular energy-production process is known as ‘cellular respiration’. Cellular respiration (also known as internal respiration) is a complex process, involving three metabolic pathways: glycolysis, the citric acid (Krebs) cycle, and oxidative phosphorylation; but the important result is that the glucose from our Frosties is converted into energy. This energy is in the form of ATP (adenosine triphosphate), known as the “molecular (or energy) currency” of intracellular energy transfer. This only takes place within cells, mostly within the mitochondria (the ‘energy factories’) but also, to a lesser degree, within the cytoplasm of the cell. The product is the energy our bodies require for every function. If there’s any excess glucose which is not required immediately, it will get stored as glycogen in the liver or skeletal muscles for future use (a process rather confusingly called glycogenesis – the reverse process to glycogenolysis). If you’re interested in a little more detail on the process of carbohydrate metabolism not covered above, see the note 5 below. If glycogen reserves in the liver are saturated, the excess glucose gets converted into fat for long-term storage in the adipose (fat) tissues – beneath the skin (subcutaneous fat), around internal organs (visceral fat) and in bone marrow (yellow bone marrow). Because Frosties contain highly refined carbs, rather than the complex starchy carbs found in whole plants, the glucose is released very rapidly. Basically, the more processed the carbs, the quicker they end up as glucose in the bloodstream. Thus, the Frosties are likely to cause what is called an initial ‘insulin spike‘. Before pinning down what insulin resistance is, we probably need to be clear on just what diabetes is. Why is this? As it happens, it took around seven decades before the answer could be provided and, thus, form the basis of the current understanding of the cause of T2D. In basic terms, fat in the cells blocks insulin from being able to usher glucose into the cells to be used as energy. 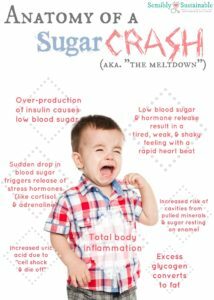 As a result of this, the sugar stays in the bloodstream, eventually filling available organs and muscle cells with fat, and reaping havoc on the body as a whole. “Prepare ye the way for the Lord”! I think it was Dr Greger who drew the comparison between blood sugar (glucose) and vampires. Just as a vampire requires an invitation before entering private homes, glucose needs an invitation before it can enter our cells. Within our bodies, that invitation comes in the form of insulin. When a cell requires additional energy, it binds to one of the insulin molecules passing by in the bloodstream and that molecule binds to a specific insulin receptor on the surface of the cell membrane. Once there, the insulin acts like a key, opening up a ‘gap’ in the cell membrane – through the release of a number of enzymes – so that glucose, also circulating in the bloodstream, can enter the cell. It’s important to understand that there’s no other way that glucose can enter the cell than through this insulin receptor. Glucose (C6H12O6) is a large molecule with 6 carbon atoms. As such. it’s too big to get into the cell through simple diffusion. This is why it needs its own John the Baptist (insulin) to ‘prepare the way for the load‘. The term used for this is ‘facilitated diffusion‘ (also known as ‘facilitated transport’) and it happens down a concentration gradient – that is, it will only happen when there’s more glucose outside the particular cell than there is inside it. 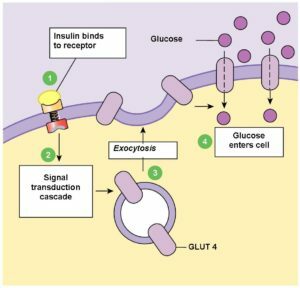 If the cell has sufficient glucose inside already, it will close up the insulin receptor and no more glucose will get inside, until more is required. This form of glucose transport within our muscles is responsible for clearing around 85% of the glucose from our blood. By the way, all of this is something a simplification of the whole process, of course. In actual fact, even the insulin receptor (one of many different types of cell receptors) has multiple additional roles in physiological processes within us. The diagram below 9 gives a brief overview of this complexity (sometimes referred to as pleiotropy – where one gene affects other seemingly unrelated traits). Insulin through its receptor affects multiple physiological processes in the organism (left) by increasing (green arrows) or decreasing (red arrows) various intracellular metabolic pathways (right). All well and good, but if the pancreas doesn’t produce insulin (as in T1D) then our muscle cells don’t get any energy, no matter how much glucose is floating around in the bloodstream, because there’s no key (insulin) to open the lock (insulin receptor in the cell membrane). This is why sufferers of T1D have to have insulin injections (the locksmith), otherwise blood sugar levels would simply rise and rise and eventually result in death. A person with T1D will have to monitor their blood sugar levels very carefully if they’re in the habit of eating bowls of Frosties – a habit which would not be recommended by any medical expert. Dr Greger explains this process in more detail in his video, “What Causes Insulin Resistance?” 12 . 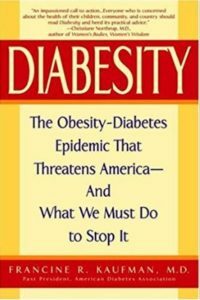 The link between obesity and diabetes (so strong now that the term ‘diabesity’ 13 has been coined) can be explained by realising that the fat spilling into the bloodstream from fat cells in obese individuals can get lodged in the very muscle cells we’ve been talking about. This then leads to insulin resistance and the onset of T2D. So, although Frosties contain very little fat (only 0.6%), if the person eating them is already obese, the blood glucose quickly resulting from their consumption will end up in the bloodstream and find that the muscle cells are already fully or partially blocked by the intracellular fat 14 . Some of the glucose will be stored as further fat deposits, while some will continue to circulate in the bloodstream. In T2D, the pancreas has been pumping out more and more insulin in an effort to overcome the fat induced insulin resistance in muscle cells. 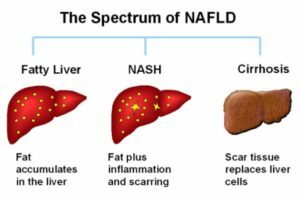 Over time, these high blood insulin levels can lead to accumulation of fat in the liver – non-alcoholic fatty liver disease (NAPFD). Before the final diagnosis of T2D, the liver will certainly be protesting, without its owner ever hearing its silent screams. But eventually, this fat build up in the liver will make it, too, resistant to insulin in the same way as it does with the muscles. Between meals, a normal liver will constantly be turning its stores of glycogen into glucose, which it then pumps into the blood to keep the brain alive; and when we do eat breakfast, after a night without dietary intake, the insulin released from the meal should turn off liver glucose production. However, if there’s too much fat in the liver, it fails to respond to that breakfast signal. The fatty liver continues pumping out glucose all day long, on top of whatever we’re eating. The pancreas responds to the high level of blood sugar by releasing more insulin, causing the liver to get fatter and fatter. Meanwhile, fatty muscles (i.e. muscle cells that have been stuffed with surplus fat), within the context of eating too many calories, leads to the fatty liver getting even fattier. And this all starts before diabetes is even diagnosed. This is why it’s a mistake to under-estimate the danger of being prediabetic. Fatty liver can be fatal and, because our bodies do all they possibly can to keep us alive (in spite of the relentless pressure we may impose on them), the liver tries to offload the fat by dumping it back into the bloodstream in the form of VLDL (very low density lipoprotein). This then finds its way into the beta (or so-called eyelet) cells of the pancreas, making it into a fatty pancreas – thereby destroying the ability of the pancreas to produce insulin. Blood sugar levels go up and up, leading to hyperglycemia – damaging the vessels supplying blood to vital organs, increasing the risk of heart disease, stroke, kidney disease, vision loss and irreversible nerve damage, gangrene, amputations and, of course, death. Thus, by looking at these two cycles, it’s possible to see how T2D diabetes develops and to understand how it is a condition of excess fat inside our organs. 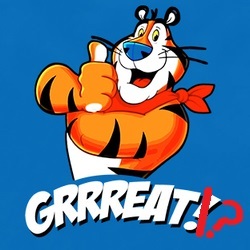 Just eating the odd bowl of Frosties isn’t, of course, going to lead to diabesity; but if we tell ourselves that eating such foods “isn’t really all that bad” (they are, after all, fortified with added vitamins and minerals! ), then we’re also likely to justify eating a whole load of other processed foods. And it’s the combination of these fatty, sugary, salty, processed foods being eaten over extended periods of time that ends up causing serious diet-related diseases. Another important aspect is that every time we choose such unhealthy foods, we establish habits and addictions that can keep us locked in to vicious cycles – starting with those silent screams within, but ending up with very apparent indications of harm that’s already been done. I think I’ll give Mr Kellogg’s offerings a miss. Where is leptin produced in the body? Leptin resistance cannot happen if there is plenty of leptin in the bloodstream. True/False? True. Leptin in the bloodstream always does its job. False. Leptin in the bloodstream does not always do its job. 4. What's perhaps the best way of increasing the effectiveness of leptin? Taking vitamins and mineral supplements. Decreasing the amount of fat in the body. A little more information on carbohydrate metabolism: Not all cells in the body are the same in relation to their requirements for glucose and only glucose. Erythrocytes (red blood cells) and neurones (brain cells) can use only glucose for fuel. This means that the maintenance of blood glucose levels is vital to ensure the provision of a constant energy source to these cells. Most other cells can also use other sources of fuel (amino acids, fatty acids, glycerol and occasionally nucleic acid) in a process called gluconeogenesis. So, while some glucose is transported to the liver (to satisfy its own significant energy requirements), and some will be oxidised in other cells around the body, a certain level of glucose has to remain in the circulating blood to maintain the normal blood glucose of about 3.5– 8 mmol/ L (63– 144 mg/ 100 ml). If there is excess glucose above blood level requirements, insulin will convert it to the insoluble polysaccharide, glycogen, in the liver and in skeletal muscles. Glycogen is the main storage form of glucose in animal cells. In humans, most glycogen is found in the liver (10% of the liver mass), with muscles only containing a relatively low amount (1% of the muscle mass), and small amounts of glycogen also being stored in some glial cells in the brain. Inside cells, glycogen-formation is a means of storing carbohydrate without upsetting osmotic equilibrium. However, before it can be used to maintain blood levels or provide ATP, it has to be broken down again into its constituent glucose units. Liver glycogen stores constitute a store of glucose used for liver activity and to maintain the blood glucose level. Muscle glycogen stores provide glucose requirements of muscle activity. Glucagon isn’t the only hormone associated with the breakdown of glycogen to glucose, adrenaline (epinephrine) and thyroxine are are also involved. Naturally, if there is an excess of carbohydrate, above that required to maintain blood glucose level and glycogen stores in the tissues, it will be converted to fat and stored in the fat depots around the body. The way your body appears from the outside when you’re overweight or obese is a fairly obvious thing that anyone can see; however, what about inside the body? The internal effects of those extra kilos of fat are not so widely appreciated. Dr Joel Fuhrman, in an off-stage video interview 1 while at the Real Truth About Health Conference 2 , gives us the low-down on one of the most devastating effects that being overweight has on our bodies. 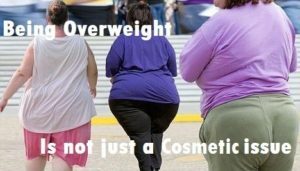 Being overweight is not a cosmetic issue; rather, it’s a serious medical condition because when you’re overweight, your body becomes insulin sensitive/resistant 3 4 . 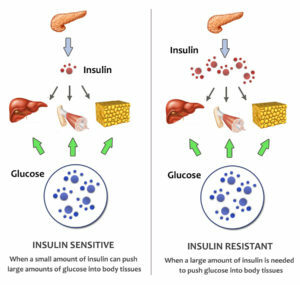 Insulin sensitivity/resistance is basically when your pancreas has to produce more insulin in response to eating foods which, if you were not overweight, would not stimulate the pancreas to produce so much. Thus, just eating oats or an apple will cause the pancreas to go into an insulin-production mode that exceeds what would happen if you were not overweight – according to Dr Fuhrman 5, up to 10 times the amount of insulin can be produced. 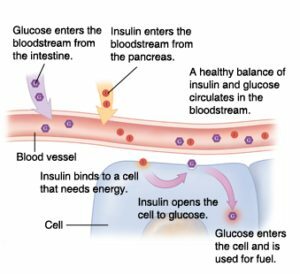 The insulin wants to put the glucose into cells, but the receptors within cells become blocked from being able to accept the glucose because of the fat within the cell 6 . This results in the pancreas having to overwork itself just in order to function normally. Any organ will suffer when it is having to overwork for prolonged periods of time, leading to type 2 diabetes and a whole host of chronic diseases. Not a lot of people realise that excessive insulin production can cause cancer 7 8 9 . As a fat-storing hormone, insulin can promote angiogenesis – that is, it can promote the growth of new blood vessels. 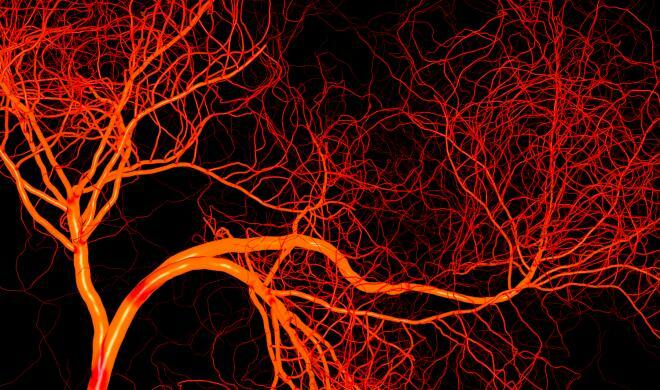 We saw in an earlier blog 10 that reducing angiogenesis is a good thing for reducing the growth of cancers, since they need new blood vessels to feed them and allow them to grow. Dr Fuhrman explains that, for fat cells to grow within the body, they need to excrete angiogenesis-promoting hormones, and insulin further promotes this process. The new blood vessels then feed the fat cells with oxygen and glucose, etc – thus making the fat grow. By doing this, it also promotes other fat cells to grow 11 . When you’re overweight, the continual circulation of insulin also promotes atherosclerosis 12 and prematurely ages the body 13 . 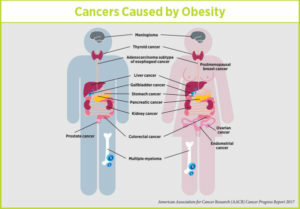 Another factor comes into play when you are overweight: namely, the higher levels of circulating oestrogen, which is linked to both breast cancer 14 and prostate cancer 15 . Dr Fuhrman considers that even being moderately overweight is a health risk. What causes us to be overweight? He considers that the so-called SAD (Standard American Diet) is what’s really to blame. It keeps us addicted to wanting more food than the body requires. But when you eat healthy food, you’re flooding yourself with healthy nutrients that the body needs. By eating the right foods, your appetite becomes normal and your weight drops, as he showed in a 2012 research project with 750 individuals who were able to naturally reduce appetite by increasing the nutritional quality of their diets 16 . When you’re body is cleaner, leaner and healthier – fuelled with phytochemicals and antioxidants – you’re not going to have to go through the discomfort of the usual detoxification process that most people experience when they are consuming the ‘wrong’ foods. People fail on diets because they try to cut back on calories without increasing the nutritional quality of the foods they eat. And it’s so much easier and more natural to reduce excessive calorie intake when nutrient density increases. Research shows 17 18 that when we are overweight, our brains are affected and the likelihood of becoming clinically depressed increases. And this isn’t just because we look in the mirror and don’t like the look of ourselves; it’s linked to biochemical changes within our bodies that change dependent on whether we are at or above our optimal weight. One in five people in the USA are now classed as mentally ill, and the link between these mental conditions and body weight is clear 19 . And research is starting to uncover 20 a surprising and unwelcome association between increased violent and criminal activity and increased rates of obesity . 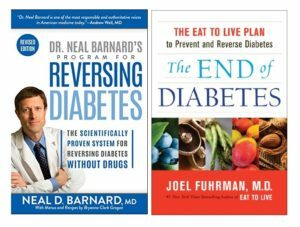 The good news is that normal function of the pancreas can be restored, and type 2 diabetes completely reversed 21 22 23 , through losing weight – ideally through eating an optimally healthy diet consisting totally or mainly of whole plant foods. There are so many benefits to being at one’s optimal body weight – both visually and in terms of the internal health of our bodies. It’s good to know that the best way to achieve and maintain this ideal body weight is not through will-power, but can be achieved naturally, healthily and relatively easily by simply eating the right foods for our bodies – that is, foods that are high in nutrients and low in empty calories. And which diet fits the bill most perfectly? You guessed, a wholefood plant-based diet that avoids added salt, oil and sugar. Keep an eye out for all the new recipes I regularly add to this website 24 . They’re all guaranteed to be optimally healthy as well as delicious and easy to make.